Pepsi was one of the first "Western" companies to establish a presence in the Soviet Union in the 1980s--probably a sign of the beginning of the end--The main problem for companies wishing to do business with Russia back then was the fact that the Russian ruble was not a convertible currency. 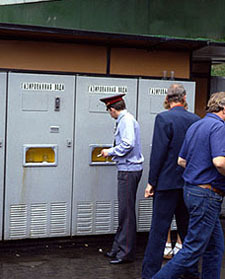 These little kiosk stands were everywhere in Moscow when I was there in 1990. Although I am far from being a big fan of Pepsi (I did learn to use Pepsi as a kind of universal mixer with "beverages" while I was in Russia. 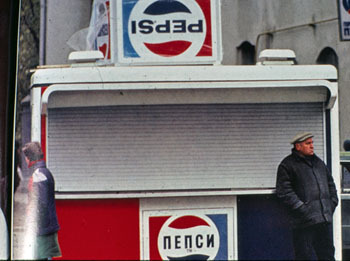 ), nevertheless, Pepsi was a definite improvement over the "gassed Water" machines common in Russia. Let me explain how these things worked. 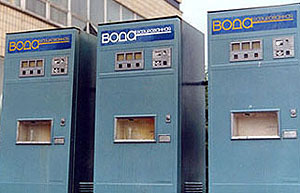 The machines worked on the same principle as the coffee vending machines that you can find in the United States. In the United States, you put your money in, make a selection, then a small paper cup drops into the slot and fills with coffee. You remove the cup and drink your coffee. The difference in these "gassed water" machines was first, that instead of coffee you were getting a kind of Sprite, or 7-Up, flavored carbonated water/soda, not necessarily cold either--Hey, it didn't taste too bad. Second, the cup was not a disposable, paper cup but a reusable plastic cup. You put it upside down in the slot and pressed a button to rinse out the cup. Then you righted the cup and filled it with the soda. When you were done, you put the cup back for the next person to use. Read the textbook chapters 43 and 44. Check the remarks by Professor Blois and Professor Evans on the End of the Soviet Union. Read the Williams Review Article on the conflict in Chechnya (Log into Blackboard and look for the article under "Course Documents."). Submit the Russian culture paper. Read Sheets, 8 Pieces of Empire (if you are going to submit the optional Sheets paper). Submit the Optional Sheets paper. If you don't understand why I call this an optional paper, take a look at the Explanation of Assignments and Grading. For 50 points maximum extra credit, watch Vor (The Thief) and explain, in a one-page paper, what was so shocking about this film for Russian audiences. For 50 points maximum extra credit, watch Kavkazsky Plennik (Prisoner of the Mountains) about the conflict in Chechnya and write a short assessment of the movie, in a one-page paper. For 50 points maximum extra credit, read Boris Yeltsin (1931-), The Struggle for Russia (1994) and write a one-page paper explaining his political ideas. For 50 points maximum extra credit, read David Remnick, Lenin's Tomb: The Last Days of the Soviet Empire (1993) and write a one-page paper in which you explain the author's analysis of why the Soviet Union crumbled. For 50 points maximum extra credit, read Vasilii Aksenov, Generations of Winter (1994) and write a one-page paper assessing the author's ideas. For 50 points maximum extra credit, read Vesselin Nedkov, 57 Hours, A Survivor's Account of the Moscow Hostage Drama (2003) and write a one-page paper in which you explain what went wrong.